It is funny how you get attached to inanimate objects. Many years ago at our church’s white elephant table – I saw the small horseshoe-shaped ashtray with the white plastic horse on top of it. I bought it because I knew it was the one that adorned a small table in my grandparents’ dining room. My grandmother asked me why I bought it. I said because it was hers. (She said she would have given it to me – if she knew I wanted it.) It wasn’t that I really wanted it – but I didn’t want a stranger to have it. To me, it was part of my grandparents’ house. An object that I had seen since I was an infant. That object reminded me of my grandparents and all the good times I had with them and the love that I always felt in that house. I still have that ashtray sitting on one of my bookcases in my bedroom. So, what about the old metal stool pictured above? Well, this stool, complete with the knitted cover (surely knitted by Nana who always was knitting or crocheting), stood in my Nana’s kitchen for as long as I can remember. This stool was always against the radiator near the kitchen table. My family had spent hundreds upon hundreds of hours around the kitchen table at my Nana’s house. It is where we laughed, played games, talked, and ate – especially when family visited from far away. Often the kitchen was so filled with family members and friends that there were not enough chairs to go around, and someone (often me) would sit upon this stool. Since my Nana’s passing in August at the ripe old age of 100 and 5 months – most of the house has been empty and it was put up for sale. My mother and I would check the house about once a week and make sure the pipes and everything were alright. We would go down into the dirt cellar. 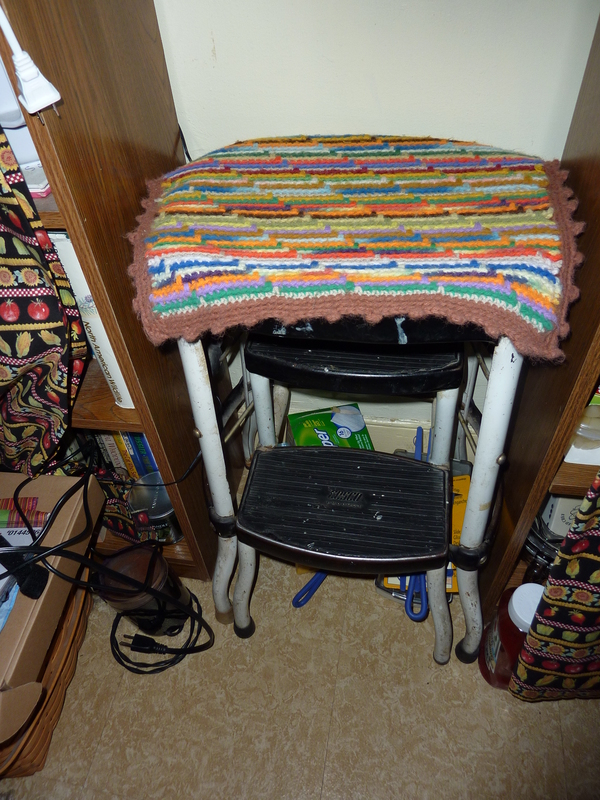 I noticed the stool standing in the cellar – still with the knitted cover. I asked my mother who was taking the stool. She said it would probably just be thrown away. I said if no one wanted it – I would like it. This old stool was very much like the ashtray to me. It was like part of my Nana and contained many memories and love that we all shared in that house and around that kitchen table. This plain old stool with the knitted cove now stands in my kitchen. When I look at it, I feel the warmth of all the hugs and laughter that filled my Nana’s house. The house will soon belong to another family, and I hope that they also will have many years in that house and feel the love that we all felt within those walls.